For an innovative and unique way to do indoor or outdoor fireplaces, check out the selection of Amantii products available from Embers Living. The Panorama Series from Amantii has glamorous and stylish indoor/outdoor fireplaces and there are also built in fireplace options as well, perfect for mounting. These fireplaces will certainly add a unique and special touch to your home. 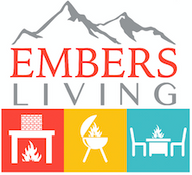 Check out the selection from Embers Living today and give your home an added touch of decor with these fireplaces.